We bought a new mattress for our v-berth. 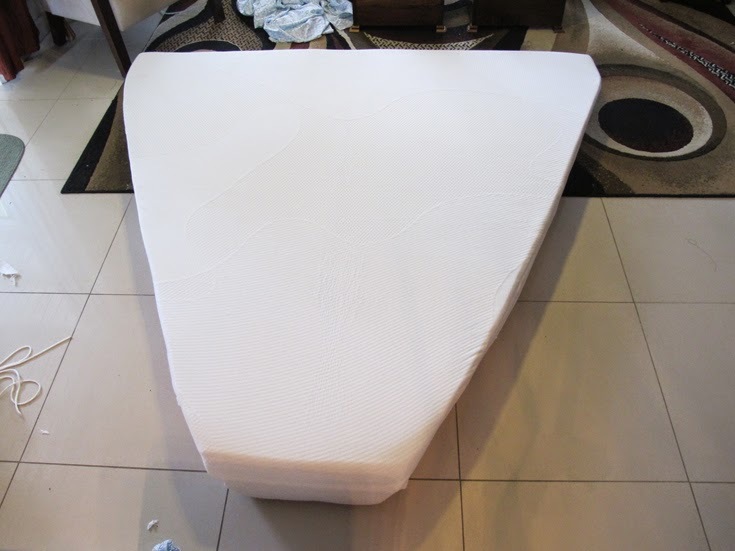 It was a king size memory foam mattress that we cut and shaped to fit in the triangular v-berth. See this post if you'd like to read more about that. 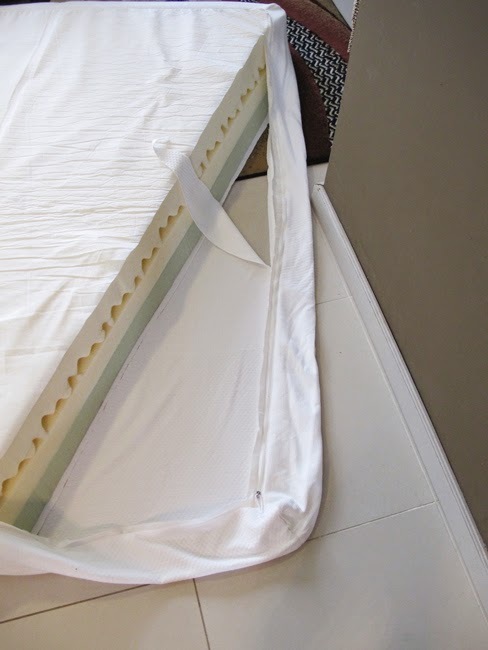 The mattress came with a nice mattress cover that zipped on. 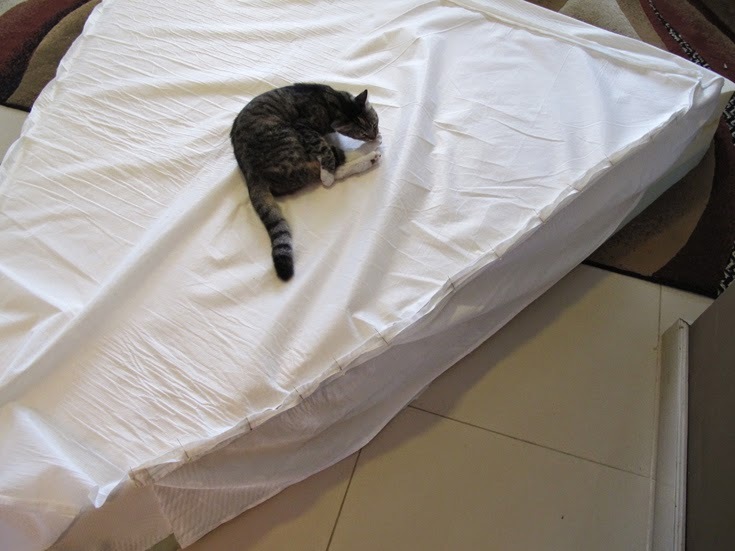 It was square though so when we cut the mattress into a triangle, it no longer fit. 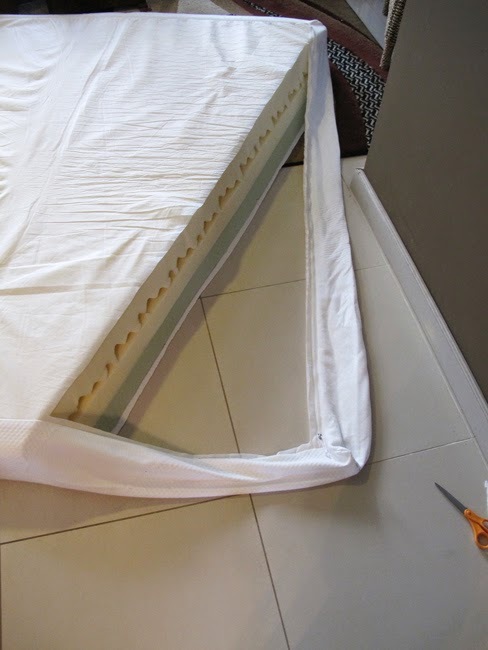 I thought about just keeping it like that and tucking under the corners by the feet, but I decided that would drive me crazy and add even more frustration when making the bed. Warning: I am not a professional by any means and haven't done much sewing so this is for novices like me! This is just how I made the cover work and might help inspire others if they are wondering what to do. I decided to cut out the triangular excess that you can easily see on each side. I cut out the top and bottom panel, leaving the sides which make up the width and house the zipper. The zipper runs from the bottom right corner up and around to the bottom left corner. 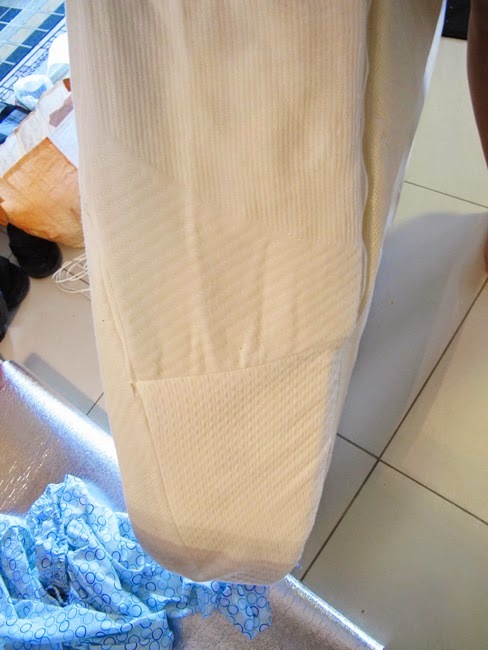 I did the same on the other side and then cut the fabric at the corners (after the zipper). Then you just pull the sides tight, trim, and sew it all back together. I turned the whole thing inside out, pinned it up and sewed it back together (the cat was "helping"). The bottom corner close up. Not perfect, but it works! And the end result! 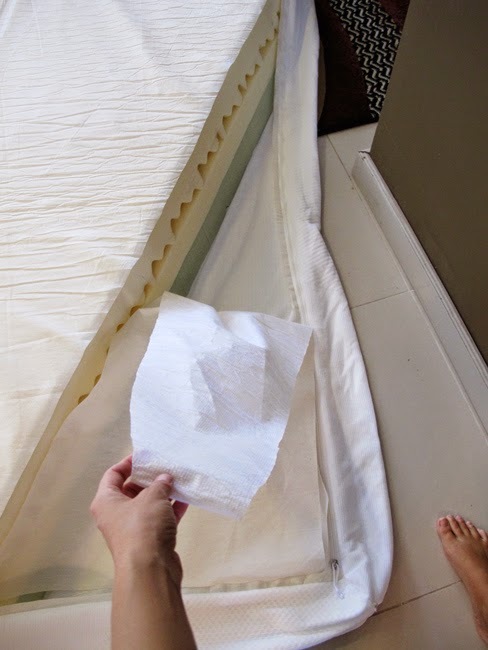 Click here to see the post on how I made the sheets. I would have majorly overcomplicated this project for sure. Thank you for posting. OK I am in....and will get started this week... You are inspiring! Hope you tackled this project and it came out great! Thank you for posting! My boyfriend didn't believe me that I could cut our queen memory foam into a full and resew cover & Certainly not with bread knife. Lol! Thanks for posting I have to the same thing to my boat the present cushions are foam and terrible to sleep on this is a very economic way to solve the problem.Good old common sense. Thanks. 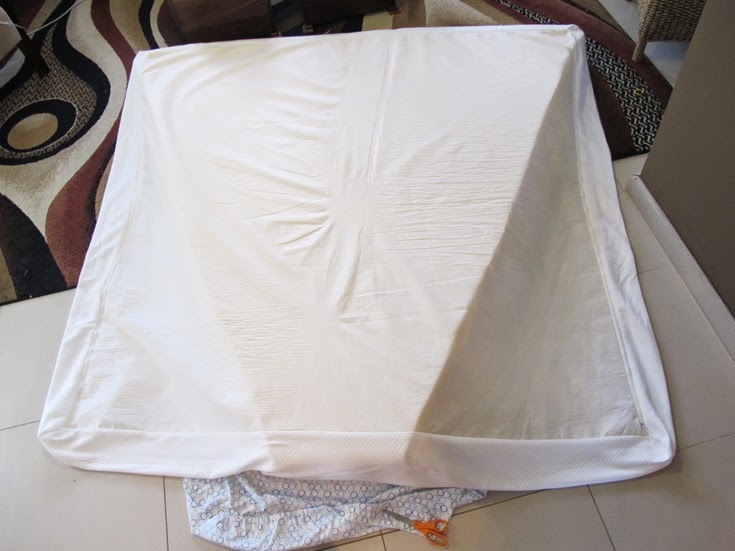 Once it is whitened, the sheeting will be rolled into a rope and place in a dryer which removes the moisture prior to dyeing. silk bed sheets The fourth is the type of weave used in making the sheets. 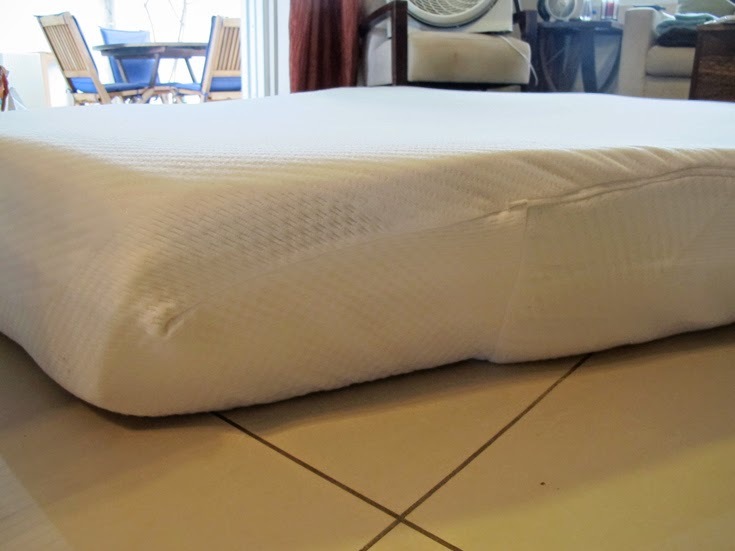 I assume the mattress you got was polyurethane because of the nice price. Latex, typically the other option, is usually much more expensive. 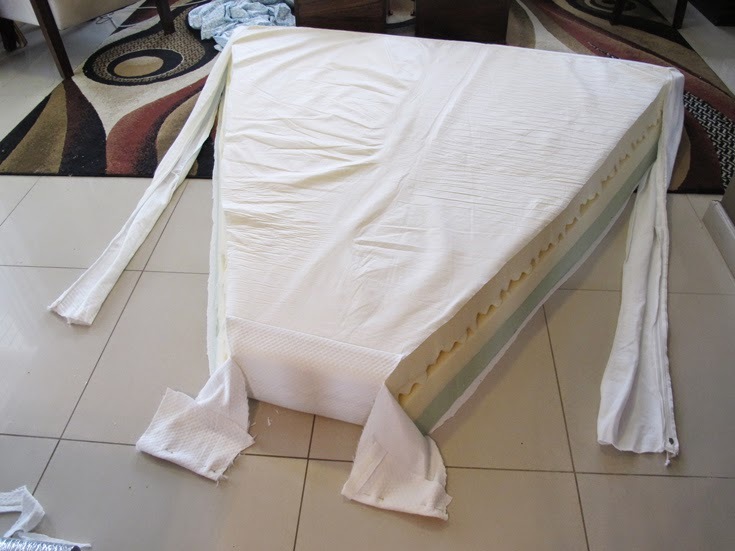 How did the mattress hold up against mold? It would be helpful if you share what climate you were in with the new mattress and how long you had it before you sold the boat....I think you sold the boat if I see things right here.. Thank you!